Charleston Sailing School specializes in creating unique yachting adventures. From our location downtown at the Charleston City Marina we offer a fleet of sail and power yachts available for Sailing Lessons, Private Yacht Charters, and Bareboat Charters. Since our inception in 2004 we have grown to provide unparalleled service with the best options at every pricepoint. Have you ever dreamed of owning your own yacht? Our team of brokerage professionals can guide you through the search, purchase, and ownership processes. The American Sailing Association’s curriculum of internationally recognized certifications was created to provide recreational sailors with uniform standards of training. We offer a series of courses that will take a complete beginner through the steps necessary to become a competent sailor. Each course offered is a prerequisite for the next. Students benefit immensely from the program of study designed and routinely modified by a worldwide network of sailing schools, professional yachtsmen, and charter companies. There is a combination of classroom presentation, on-water training, written and practical testing associated at each level of certification. Theory is taught shore side, practiced underway, then reinforced with testing on the water and in the classroom. It is our objective to teach students how to sail with confidence, as we advance methodically from one course to the next. Class times are from 9:30am-5:30pm daily (with some exception for wind, weather, & tides). There will be an hour lunch break around noon daily. Students are encouraged to pack a lunch or venture next door to the restaurant on site. Bottled water is provided throughout the day, and feel free to bring your own snacks or refreshments. Come prepared to be outside the majority of the time; Sun, wind and rain protection are key. Don’t forget your camera! 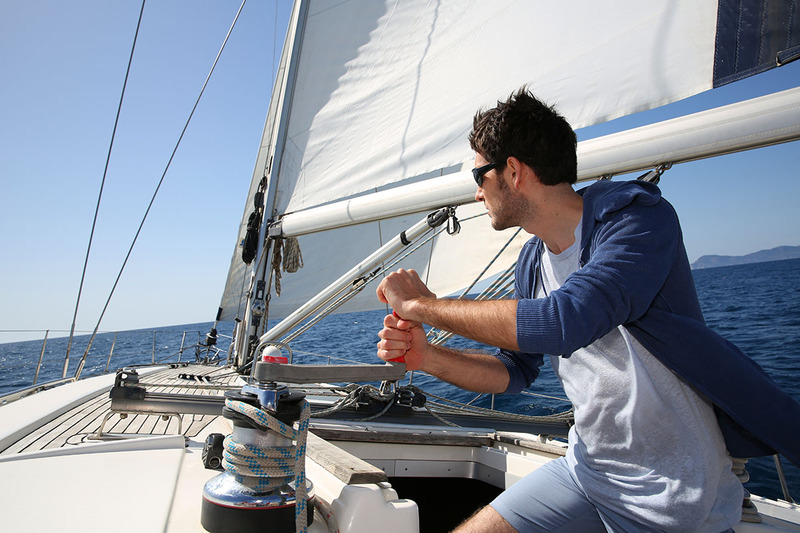 The Basic Keelboat Sailing Class is designed to get the new sailor off on the right track. You will learn basic sailing through a proven combination of classroom and on-the-water instruction. There will be 16 hours of instruction over two days. Areas of instruction include sailing theory and extensive practice, terminology, sail trim, points of sail, rudder control & commands, rigging for sail, docking and undocking, basic seamanship, knots, crew coordination, safety skills including rules of the road, federal equipment, lights, crew overboard prevention and recovery techniques. $550 (plus tax) per person; includes course materials, operating expenses, and certification. Our cruising class opens up a new sailing opportunity. You will be able to cruise safely in coastal waters as both skipper and crew on an auxiliary powered sailboat of 30- 35 feet in length. Classes include 16 hours of classroom and on-the-water instruction over two days. Areas of instruction include advanced sail trim; intermediate boat handling at buoys, docks and slips; anchors and anchoring; small craft warnings and heavy weather sailing; reefing; fog conditions; crew coordination; gasoline outboard and diesel inboard engine operation; fuels & refueling procedures; boat systems; operation of tiller and wheel; compass and chart reading; VHF operation; emergency procedures, flare usage and hypothermia treatment. $700 (plus tax) per person on a monohull or $900 per person on a catamaran; includes course materials, operating expenses, and certification. The Bareboat Chartering Class is designed to give the Coastal Cruiser the information and skills to sail a 30 to 50 foot auxiliary sailboat on a Bareboat Charter. The liveaboard course includes limited classroom presentation, with the majority of time spent aboard and underway during instruction over three days. Two nights aboard anchor are included with food provisions. Areas of instruction include: large boat handling and seamanship; voyage planning; packing and provisioning; meal preparation and sleeping aboard; coastal navigation & landfall at sea with bearings, fixes and time/speed/distance calculations; mooring, docking, and anchoring techniques are practiced. Ship’s systems including: plumbing, electrical, mechanical, and diesel engine maintenance & troubleshooting techniques are introduced. Entry into foreign ports and customs procedures, as well as international nautical etiquette are addressed. $1200 (plus tax) per person on a monohull or $1,500 per person on a catamaran; Includes course materials, operating expenses, ASA certification, food provisions, and 2 overnights aboard. Students will be able to demonstrate the navigational theory required to safely navigate a sailing vessel in coastal or inland waters. 1 full day of classroom presentation and testing can be combined with 2 days of on water practical training. The practical is optional with this course, but highly recommended. This course takes all variables in navigation into account. Multiple ways of establishing a fix, estimated position, and plotting a course, while taking into account set/drift/leeway are all covered. Chart reading/updating, useful publications to the navigator, and tide & current predictions are taught. Compass deviation, magnetic variation, GPS, and other electronic aids are used to create cohesion between paper and electronic navigation. 1 Day – Classroom only – $400 (plus tax) per person; includes course materials, and ASA certification. 3 Day – Class and Cruise – $1,350 (plus tax) per person on a monohull or $1,650 per person on a catamaran; includes course materials, ASA certification, operating expenses, 2 nights aboard, and food provisions. Take you skills to a new level. This course is physically and mentally demanding as you will be introduced to sailing, man overboard recovery, and making landfall after dark. Advanced sail trim and theory, engine maintenance, offshore storm preparation, and anchoring in severe weather are all addressed Upon completion of this course you will be able to safely act as skipper and crew of a sailing vessel about 30 to 50 feet in length in all conditions. This is a day and nighttime standard in coastal and inland water, in any weather. $1,800 (plus tax) per person on a monohull or $2,200 per person on a catamaran; includes course materials, instruction, certification, 2 nights onboard, and food provisions. This is an advanced cruising standard for individuals with cruising experience and must have completed ASA training through the 104 level. After completion students will have the confidence necessary to act as skipper and crew of a 30-50 foot multihull sailboat by day in coastal waters. Areas of instruction include: catamaran specific vocabulary, performance based on weight distribution, use of daggerboards, and sail trim/combinations. Offshore storm preparation, anchoring, and docking techniques specific to multihulls are demonstrated and practiced. The standard includes those skills unique to a 30-50 foot multihull. The premier sailing school in the Caribbean. Specializing in day tours and week long “Cruise and Learn” vacations. Our instructors are the best in the industry. LTD Sailing is your sailing solution in the Windward Islands of the Caribbean. We provide sailing instruction on day trips and on our week long, live aboard Cruise and Learn courses. Learn to sail while cruising the wonderful Caribbean islands of the Grenadines, St. Lucia and Grenada! This course will take you from the basics through ASA Bareboat Charter certification. This course will help you learn the basics and earn your ASA Bareboat Cruising and ASA Cruising Catamaran certifications. This course will cover all the material from our Basic Cruise and Learn course PLUS everything you need to know to start living your sailing dreams – if those dreams include Catamarans. The prerequisite for this course is ASA Bareboat Cruising certification (ASA 104) or equivalent experience. This course is designed for experienced mono-hull sailors who want to give the world of catamarans a try. Combine this course with a longer bareboat catamaran charter. Take one of our instructors along for the first couple days and enjoy the rest of you charter on your own. This course covers all of the sailing and handling intricacies of sailing a modern cruising catamaran. Enjoy the comfort, stability and speed of sailing a cat. Bareboat Cruising (ASA 104) and substantial coastal cruising experience are required as prerequisites for this advanced cruising standard. This course is designed for experienced sailors who want to take their sailing to the next level. This course explores night sailing, advanced sail trim, heavy weather tactics and coastal navigation. 5 Oceans Marine Group has partnered with ASA certified Sailing Schools in Charleston and Grenada to assist our clients in realizing their dream with confidence.